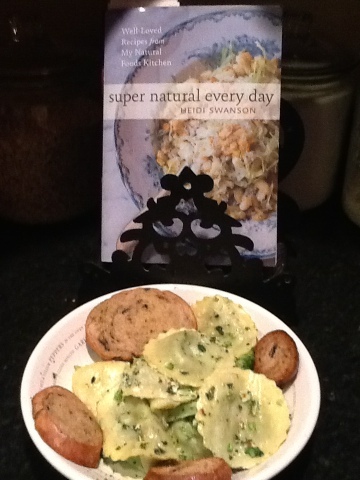 I've developed a culinary crush on Heidi Swanson's SUPER NATURAL EVERY DAY, an accessible cookbook that will have you cooking cozy vegetarian, whole foods...without ever missing the meat. Which is exactly what a steak eating girl like me needs. As part of my ongoing desire to increase health and decrease weight, I am making a conscious effort to add more vegetarian meals into my diet and Heidi Swanson's cookbook makes that goal effortless. The food is comfort food, the recipes are straight forward week-night dishes that can be prepared quickly and without a lot of fuss. You'll find that you'll have most ingredients on hand, or that you can adapt as recipe with what you have, as I did for tonight's recipe. I believe you'll also find yourself inspired to expand your shopping list / pantry staples to try some of the other recipes. Which makes this cookbook a win-win. Tonight I adapted her Harissa Ravioli recipe. Into boiling, salted water, I added spinach ravioli, and half a head of fresh broccoli florets, chopped in bite-size pieces. While that cooked...in my favorite Sautee pan, I heated olive oil, chopped garlic, and red pepper flakes. When the pasta was cooked I drained it and the broccoli and added it to the heated oil, tossed in a handful of goat cheese crumbles, and voila. Are you incorporating more vegetarian meals into your weekly menus?